Take Comfort, Year in and Year out! LX Series split system air conditioners fit your needs with select ENERGY STAR© models that reduce your utility bills and MicroChannel Coil technology that provides more cooling in a smaller footprint. ENERGY STAR© qualified air conditioners meet or exceed the EPA energy efficiency standards. Compared to standard models, ENERGY STAR© qualified York air conditioners are about 25% more efficient! Less can be so much more... Our exclusive MicroChannel Coil packs more cooling capability in a smaller, compact cabinet — wasting less space and less refrigerant. Trust York to keep costs and temperatures down. LX Series split system air conditioners fit your needs with models that are extremely quiet and utilize Advanced MicroChannel Coil technology that provides more cooling in a smaller footprint. All of our York Air Conditioning systems utilize R-410A - an advanced refrigerant that doesn't harm the ozone layer while providing reliable, efficient performance. The Good Housekeeping Seal gives you the added assurance of product replacement or refund of the purchase price if it proves to be defective within two years from the date sold by an authorized dealer. As a licensed Air Conditioning Contractor, Hannabery HVAC provides high quality, professional air conditioning installations, air conditioning replacements, air conditioning repairs, air conditioning maintenance, and related services for the greater Lehigh Valley; including Allentown, Bethlehem, Easton, and all of Eastern Pennsylvania. 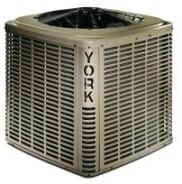 Have your York Air Conditioner professionally installed today!